Srinivasa Ramanujan was a natural genius and had his own way with numbers. With no formal training whatsoever, and immense hard work, he got his work noticed by the mathematical community. What Ramanujan could do with numbers, indeed was extraordinary. G.H. Hardy a famous English mathematician paid attention to Ramanujan’s letter, invited him to work with him and began a partnership with him. However, Ramanujan was a strict vegetarian and couldn’t sustain a healthy stretch there in England. He often fell sick and passed away at a very young age. In his short time during which he was here, he contributed a lot to the mathematical community. Ramanujan is not a very well known personality. People from the mathematics community, Indians and others know about him, yet most people haven’t ever heard of him. Some people however still do remember him and have their own way of paying personal tributes to this born genius. One such man is a famous producer and writer, Dr. Ken Keeler – Also an Applied mathematics Ph.D from Harvard. In the popular animated show Futurama, he often brings pseudo-hidden references to certain numbers which are his clear ways to pay tribute to Ramanujan. No! It is a very interesting number; it is the smallest number expressible as the sum of two [positive] cubes in two different ways. That is to say, it can be written as (10)^3 + (9)^3 and also as (12)^3 + (1)^3 and also is the smallest number which can be written like that – as sum of 2 cubes in 2 different ways. 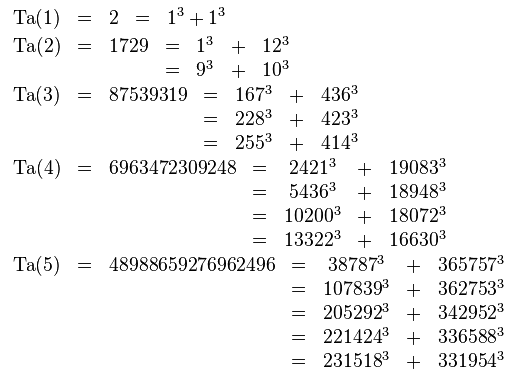 It was incredible for Ramanujan to have suddenly conjured up such a mathematical visualization out of a seemingly uninteresting number. Since then the number 1729 has been known as the taxicab number and is denoted as denoted Ta(n) or Taxicab(n) in mathematics. I first found out about this from Author Simon Singh. He talks about 1729, Ramanujan and other taxicab numbers in the numberphile video below. very interesting article. First when I read it I was completely blank and could not understand anything, then gradually I kept on reading for 3 to 4 times and then I came to understand. The main point is I have never seen anybody making a broad calculation with a taxi number. I really appreciate your intelligence. Hey, thank you for the appreciation. It wasn’t me. It was Ramanujan. Those great minds are rare. And I’m no where close. I just caught the story.